There are a couple different ways to replace a missing tooth. You can decide on a dental bridge or an implant. There is also something called a post and crown. If it seems like the only way you will be able to understand all the dental treatments available today is to become a dentist, not true. Today we explain the differences between a post-retained crown and an implant. What Is a Post-Retained Crown? When there is not enough tooth structure left to maintain a crown. To stabilize a weakened tooth. If the nerve is exposed. If there is decay below the gum line. 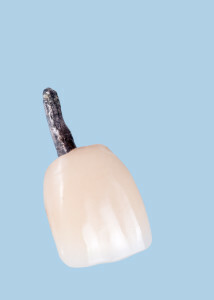 The root of the tooth remains in the gum during a post-retained crown procedure. A small rod or post is inserted into the root canal with some of it protruding above the gum line. The post above the gum line serves to anchor a crown or sometimes a large filling. Because the post is inserted into the root canal, a root canal procedure is required first. Once the pulp has been removed from the canals, disinfected, and filled with gutta percha, the post is then placed. In the case of an implant procedure, the tooth is extracted and a titanium post surgically inserted into the jaw bone where the tooth originally was. Once the titanium post osseointegrates, or locks, into the jaw bone, it is as stable as the original root and is ready to be crowned.